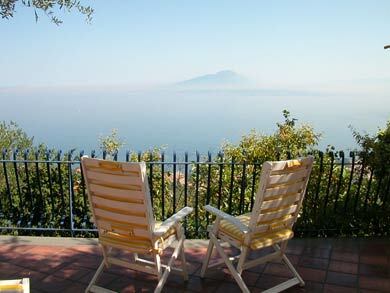 The Sorrento Holidays agency provides apartments and villas across the whole sorrentine peninsula, the Amalfi coast and Capri. Visit our web site and choose the accommodation which best suits your requirements. It is difficult to find a splendid villa with swimming pool, hidden and surrounded by greenery, with a magnificent panorama which dominates the entire Sorrentine peninsula and the Bay of Naples. The villa has a good position since it�s only approx. 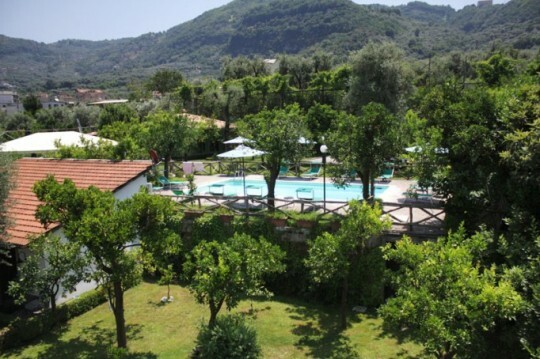 5 km from Sorrento and 3 km from Sant�Agata, a pretty village both traditional and at the same time modern with all facilities such as "Don Alfonso" one of the most popular restaurants in Europe. It is well to remember that famous writers, musicians and poets have all sojourned in Sant'Agata attracted by the many enchanting views that one can admire, by the countryside and by the salubrious air which one can breathe. In about 20 minutes by car or bus you can reach the sea where you will find enchanting pebble beaches, both free and with private bathing establishments, plus restaurants where you will be able to taste fresh fish dishes and local specialities. For those not using a car the bus stop is just 50 metres away. The railway station and port are about 5 km away and, from the latter hydrofoils for Naples, Ischia, Procida and the enchanting island of Capri (where it is easy to meet Italian and foreign VIPs) leave frequently. At distance of about 16 km there is the splendid town of Sorrento where you can find a lot of shops, restaurants, bars, discos and the theatre where you can see the Tarantella Show. From Tasso square, the main square in Sorrento, you can reach in 5 minutes by walking, the train station to go to Pompeii, Herculaneum and Vesuvius; at distance of 300 metres from Tasso square yuo can reach the port with hydrofoils to the Island of Capri, Ischia, Procida and Naples. It seems incredible to think that it is possible to spend a holiday in a tranquil location surrounded by nature, whilst in front at only 100m, is the Hilton hotel and the lively, cosmopolitan center of Sorrento is only a mere 400m away. 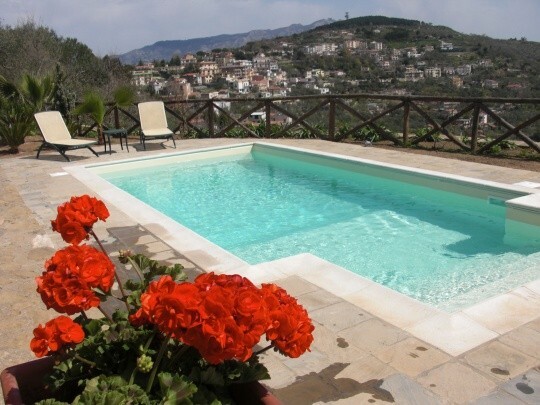 However, this is possible if you choose for your stay a completely restored and well furnished apartment situated on the upper floor of a villa immersed in a characteristic and extended Sorrentine citrus grove having in the centre a nice swimming pool of 50 square metres. Among other things, the apartment has a beautiful terrace of 30sqm that gives onto the citrus grove and where you can take a tan or eat in complete relaxation. Also, having heating, the apartment is very pleasant for a winter holiday. Private car park. Approx 1 km to the sea, train station/Bus terminus at 800m, shops, bars and restaurants approx 250m. A small piece of countryside only 350m from the centre of Sorrento isn't easy to find! 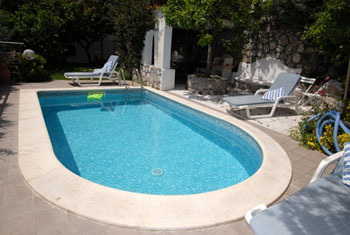 We offer five airy, comfortable and well furnished apartments, set amongst citrus trees and with use of swimming pool. Separate entrance and private parking space. Shops and bus stop at a distance of approx. 50m and descent to the sea at approx. 750m trains to Pompeii and Naples at 450m. The apartments are ideal for holidays not only in summer but also in winter, having the benefit of automated central heating. 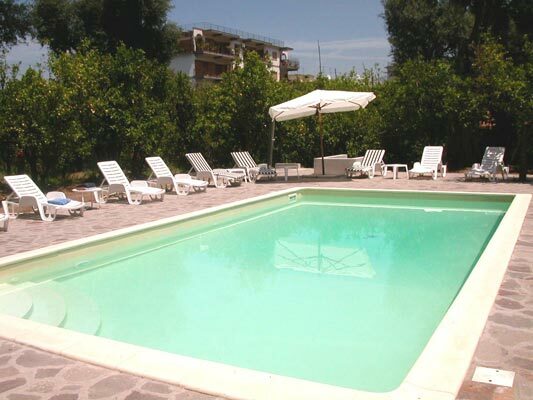 The position of this villa is really enviable: it is about three minutes walking from the village centre which offers every facility but at the same time the position guarantees privacy and tranquillity. The villa is, in fact, situated in the middle of a cultivated area... surrounded by flowers and mediterranean plants and its terraces and gardens overlooking the sea and the islands of the gulf make it ideal for breakfasting and dining in the open air. It is located at about 330m from the village centre and about 10 minutes drive from the centre of Sorrento plus some of the most lovely beaches of the Amalfi costline are within a short distance.